On July 4, 1976 - the peak of America's Bicentennial - my grandmother boarded a private jet and flew with a co-worker from Denver to Montreal. It was only her second time traveling outside of the United States (following a brief border crossing into Mexico in the 1960s). From an oral history interview, she recalled that the flight to Canada was bumpy and made her nauseous. Once she landed and was on terra firma she had a spectacular time. She remembered how beautiful the European-esque buildings were, and the green cityscapes provided a refreshing escape from the city's hustle. My grandmother was a world traveler - both literally and figuratively. I travel a lot for my career and, since my very first flight (a trip to Hawaii for Sea Camp), I always made it a priority to share the adventure with my grandmother. 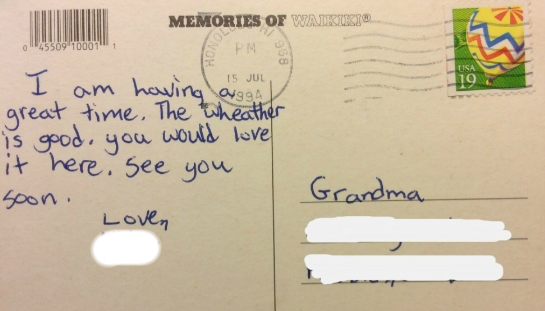 Over the course of 20 years, I mailed her a postcard from each of my destinations. The memories sent home began short and sweet, but grew more in-depth over the years and illustrated insights about the sites, adventures, and local life. Beginning with Hawaii to over 40 countries across 5 continents, my grandmother traveled with me. Not literally, but she always shared in the adventures - albeit with a postage mark stamped across them. Today, on what would have been her 79th birthday, I count myself fortunate that she saved each of these adventures.